I recently completed my Master of Science degree in Biological Sciences from Western Michigan University. My research took place in the lab of Dr. Stephen Malcolm and involved plant-insect dynamics. Specifically, I was interested in understanding how varying larval monarch butterfly (Danaus plexippus) host plants affects adult coloration, mass, wing size, and other physical characteristics. 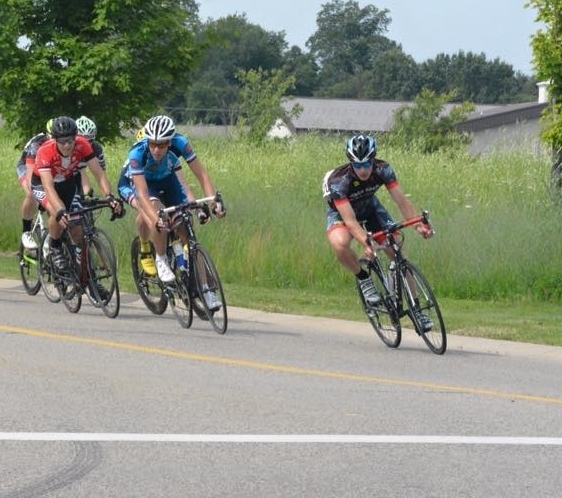 Pictured far right: Racing at the 2015 Miller Energy Criterium in Kalamazoo, MI for the Bissell-ABG Cycling Team. I graduated from the University of Michigan with a Bachelor of Science in Environmental Science in December 2012 and started at a full-time position as an Environmental Specialist at Veolia Environmental Services in March 2013. After gaining great experience in the environmental service field, I left Veolia in September 2014 to pursue a Master of Science degree in biology in an effort to shift my career towards natural sciences. Outside of my professional life, I am an enthusiastic cyclist, runner, and rower. Having rowed for the University of Michigan Men's Rowing Team in college, I transitioned into competitive cycling after graduation. I now utilize rowing and running as cross-training options to complement road cycling. I am also a co-host of the podcast Eclipse on Tap. A podcast that covers astronomy and space related events, namely eclipses!